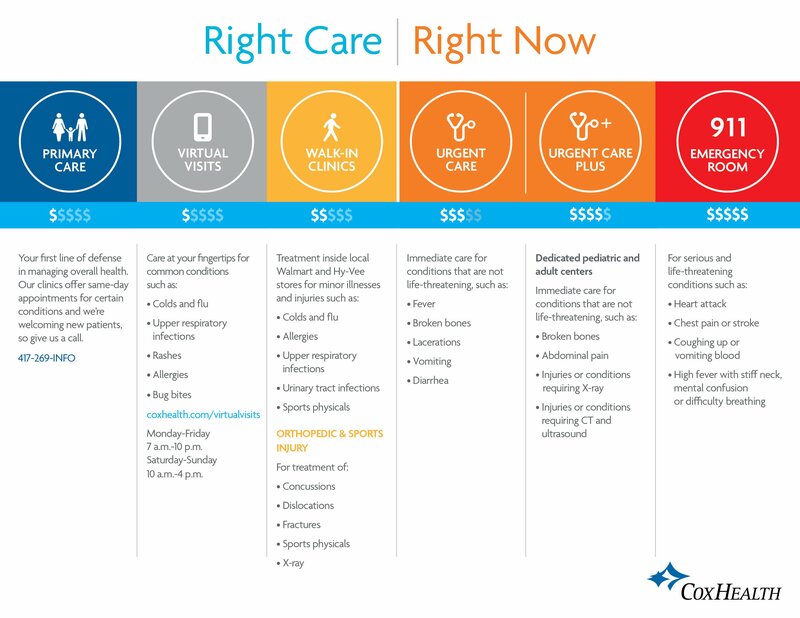 This is health care on your schedule, and on your terms. At CoxHealth, we're committed to finding ways to make health care simpler, more accessible and easier to use. With tools like Virtual Visits and Save My Spot, you can skip the waiting room and spend more time recovering in the comfort of home. Or if you're looking for a primary care doctor, we have hundreds to choose from so you can be seen quickly. Search for a physician below, schedule online or call 417-269-INFO to make an appointment. Looking for a primary care doctor near you? We make it easy. Search by location, condition and more to find the provider who's right for you. Spend less time waiting in line when you're feeling under the weather. With Save My Spot, choose an urgent care or walk-in clinic location and time, fill out a simple form and wait from the comfort of home. When you don't want to leave home and you don't want to wait, use your phone or laptop to start a virtual visit with one of our board-certified nurse practitioners or physicians. Convenient, affordable care without an appointment for minor illnesses and injuries, colds, the flu, some vaccinations and more. One-stop care for illnesses and injuries that aren't life threatening but need care fast. CoxHealth has five emergency locations offering immediate care for life-threatening emergencies that need treatment now. Find the nearest location or call 911. Not sure which option is right for you? Here's a simple tool to help you decide. We make it easy! Schedule online anytime, or give us a call.